Heavy gauge plastic thermoforming is also an option for OEMs exploring metal replacement opportunities, and Productive Plastics (Mt. Laurel, NJ) has published a design guide to help them. The Fiberglass to Plastic Thermoforming Comparison and Conversion Guide is available as free download in a PDF format from the Productive Plastics website. 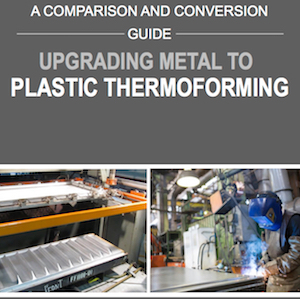 The guide includes an overview and comparison of the fiberglass and plastic thermoforming processes and insights on material weight and performance considerations as well as tips on making the transition from metal parts. “This metal-to-plastic-thermoforming conversion guide can really help customers who are considering changing to the lighter plastic material,” said Chief Operating Officer Evan Gilham. Thermoforming is the plastic production process that heats a two-dimensional rigid thermoplastic sheet and uses vacuum or pressure to form that sheet into a three-dimensional shape. Productive Plastics’ core competency is in cut-sheet heavy gauge thermoforming with sheet materials ranging in thickness from 0.060 to 0.500 inches. Typical applications include transportation, aerospace, industrial equipment, medical devices, kiosks and many types of plastic enclosures.